Team Sibley's latest collaboration. She has 100% airbrushed makeup! We’ll be adding more specific tutorials for different airbrushing techniques and applications in the future. What are you waiting for? Get airbrushing! i’m sorry i reply on this blog, while my question is about something else..
i just don’t know this website and i couldn’t find another way to get in touch with you. 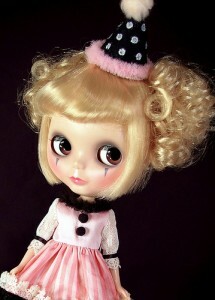 i can do this to petite blythe too, right? i find the ironing a bit scary.. but i read about the boiling water way. how does that work? Are the 1th en 2th steps the same? I’d also like to know if i can dye the hair easely. Hi Loes – the wet towel/iron trick works on most vinyl/plastic dolls with acrylic hair, including petite blythes. be careful not to get the eyelashes too wet as they may come out. they make tiny craft irons that may work better on such a small head. you can also hold her bangs down with a fabric headband (strips of pantyhose work well for this) and dip the crown of her head into almost-boiling water if the iron is too large and clumsy. Dye only works on blonde or white hair since you can not remove color from acrylic hair. we’ve used RIT with varying degrees of success. be warned that acrylic hair will shed color after it is dyed that may stain rubber and plastic body parts. I have a “redhead” that I dyed with tangerine rit that rubbed onto the tops of her ears and shoulders. I would only recommend dye on short-haired girls. oh, and always test first on a small cutting of hair from the underside of her head! I’m sorry this is not about the post topic, but do you know what happened to the “Meet the Sweetles” web site?? Do you know how to contact them? or do you know any other web site with a Blythe house tutorial?? It would be great to have some information of the materials or ideas to make one!! Would love to try techniques! Thanks for sharing your expertise. Where can I buy Blythe(takara)? Thanks for a reply. Hi- I am getting a “403 forbidden” page on your tutorials- just thought I would let you know in case others are getting it too. We are working to get the site back up to full functionality. in the meantime, please use the search bar or browse the archives. i would like to learn the skill “New Blythe Tutorial: Airbrushing Basics” where can I learn it from.